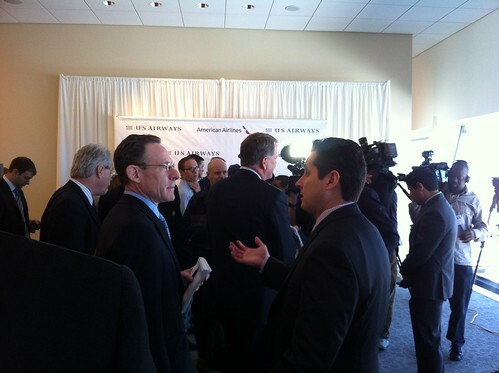 American Airlines and US Airways hosted a joint press conference this morning at the Terminal D Admirals Club at DFW Airport. Parked just outside the window of the club was an US Airways A321 that had arrived early this morning carrying US Airways CEO Doug Parker and his team to Dallas for the media event and for a later meeting with American Airlines employees. The invitation to the press conference arrived in my inbox at 5:30 this morning and the event was schedule to start at 10 AM central. 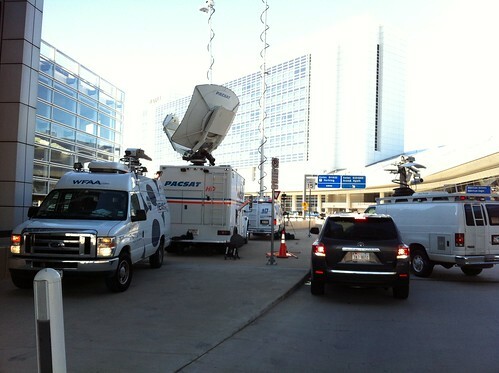 I arrived at DFW around 9 and there were already a circus of satellite uplink trucks trying to find parking spots out in front of the terminal. For that last couple of weeks as American and US Airways moved toward finalizing the merger, people from both airline’s PR staffs worked together, along with the lawyers, to put together the New American Arriving merger website and this video about the merger. The last few days the communications teams worked to put together press materials, order the banners, and co-ordinate the details for the press conference. Most of the people that I spoke with had had very little sleep these last few days (and that includes Doug Parker). 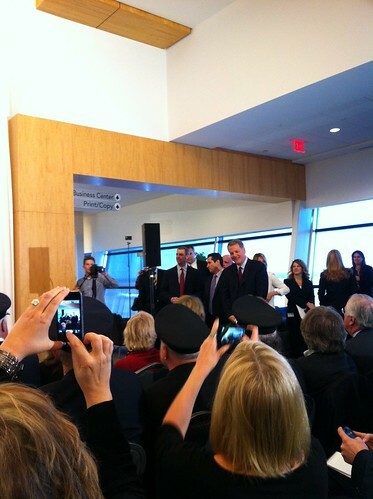 It wasn’t just media, there were lots of employees, including pilots, flight attendants, in attendance. 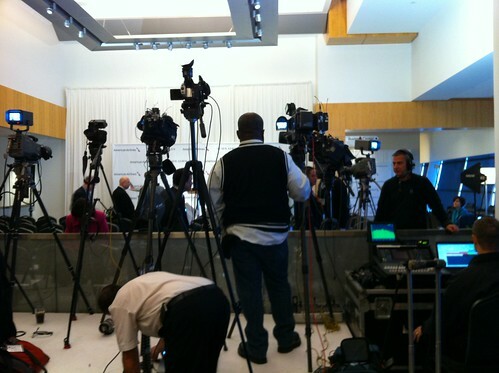 Before the press conference began everyone had an opportunity to circulate and talk with each other. I got a chance to visit with Edward Russell of Flight Global and to talk about his recent flight on American new 777-300ER. He also wrote a great analysis of the merger, so if you’re interested in the financial side of the story go here to check out what he wrote. 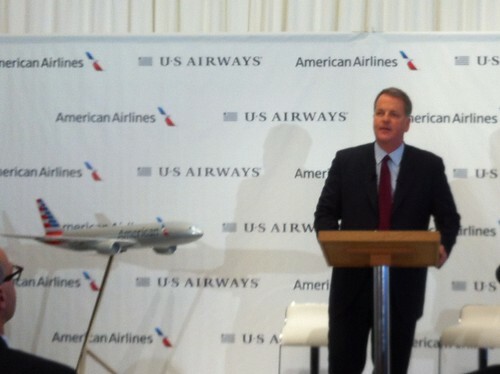 Tom Horton, American Airlines CEO, started the press conference reading from prepared remarks, he described the merger as the “best next step” for American. 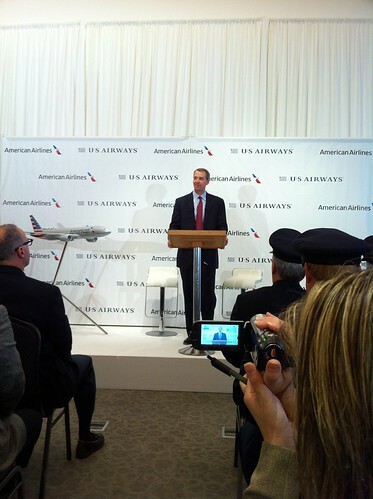 Combined, the new American will be valued at around “11 billion dollars” and will “offer more than 6,700 daily flights to 336 destinations in 56 countries”. After Mr. Horton finished speaking he introduced US Airways CEO, Doug Parker. Mr. Parker described how he and Tom Horton have a long history of working together, having worked in cubicles across from each other back when the both started their airline careers working at American. Mr. Parker was excited and spoke pretty much without looking at his notes. He got a laugh from the crowd when he remarked that given that “the merger was so widely reported up until now, he was kind of surprised anyone showed up”. He emphasized that the two airlines will be run as two separate airlines and that they will continue to compete until the merger is complete when they receive approval from the Bankruptcy Court judge and the U.S. Department of Justice Antitrust Division. They are hoping to close the transaction sometime in the third quarter of 2013. 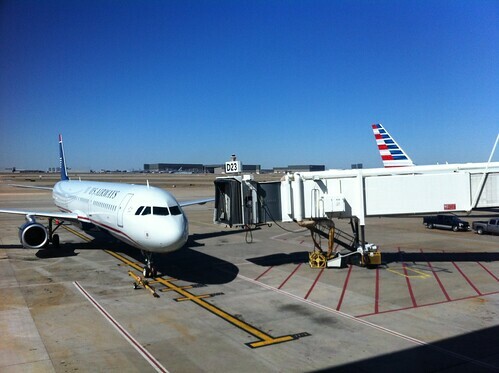 Until the transaction is closed, American and US Airways will continue to maintain separate frequent flyer programs, but after the transaction closes they will work closely to combine benefits for their members. Mr. Parker emphasized that the new airline will be a member of the oneworld Alliance and that the AAdvantage program will remain. From his previous experience merging America West Airlines and US Airways, he said is of the view that it makes more sense to join the smaller airline (US Airways) with the larger airline (American). How will this impact the aircraft delivery schedule? Tom Horton: We’re on track to tak deliver of 60 aircraft this year. Several more 777-300s, and A321s and A319s, that won’t change. Doug Parker: Combined we’ll be taking deliver of more than 607 planes the next few years. Will you change the livery again? Tom Horton: Some people say that if you look at the livery it already looks like a combined logo. We will be taking delivery of 60 new planes this year with the new livery. Tom Horton and Doug Parker both described how before the transaction closes, each company will be able to appoint members to an integration team and will designate an integration team leader to help smooth the process. Amenity kits, meals, cabin design, branding, all the cool stuff, Rob has a role in all the those items. 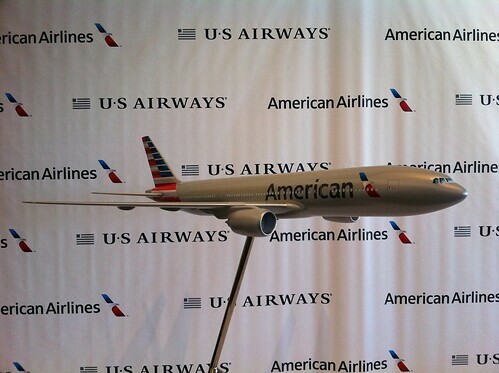 He and his team are intimately involved in creating the passengers experience for American’s customers. I got a chance to visit with Rob Friedman about how the merger would impact customers. I asked him if American was going to change their emphasis on creating a premium passenger experience? He said no, “we’re going to continue to build on that momentum”. He described how they would be introducing in-seat entertainment system in the main cabin on their new 737s this year, they are still planning to launch the their 3 cabin, A321-transcon service 4th quarter, and that they would continue to invest in providing the kind of amenities that their frequent flyers want. I know that one of the differences between US Airways and American is that US Airways doesn’t offer meal service on flights of less than 3 hours. I asked Rob if American would move to eliminate meals on flight of less than 3 hours. He didn’t think it would be practical given the number of sub 3 hours flight from Dallas. The 777-300ER Premium Cabin Snack Bar. He said that passenger feedback has been very positive. I know a few people have wondered if American would continue to stock the snack bar with such a generous selection of snacks. He said that they would, but that they would adjust the assortment and variety based on how well the food items perform and on feedback from customers and flight attendants. I also saw Maya Leibman. She’s always nice when I see her and jokingly apologized for removing the sorting feature at AA.com. She said the web team “got a little feedback about that”. At this time, American and US Airways will remain separate companies and each company will maintain its current loyalty program — our AAdvantage program and US Airways Dividend Miles. I want to assure you that your AAdvantage miles are secure and existing miles will continue to be honored. Likewise, your elite qualifying miles and your elite status, including lifetime status granted under the Million MilerSM program are secure and remain intact. The AAdvantage program, including the elite program and its various facets such as lifetime status, upgrades, and bonus mileage, are intact, and as an AAdvantage elite status member, you will continue to enjoy unparalleled benefits through one of the largest and most popular loyalty programs in the world. Ultimately, the combined company is expected to offer members more opportunities to earn and burn miles from an expanded global network of routes and partnerships, unmatched redemption options including flights, hotels, car rentals, vacation packages, one-way awards, lounge memberships, and much more. Most of the people I spoke with were sleep deprived. Nobody was surprised by the merger. In fact, most of the people that I talked to had been working on some facet of the merger announcement for days, so to them it was just another project with a deadline. Everyone seemed excited to finally have it done. One person said that several months ago when US Airways first made the overture, there was a lot of us vs. them, but as American righted their balance sheet and got through the process of reorganization, that us vs. them feeling went away because it didn’t feel like “we were going into negotiations in a position of weakness”. 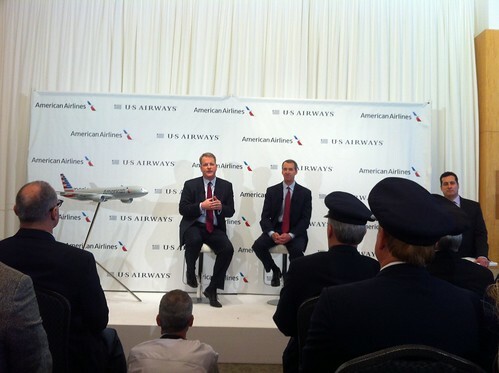 The pilots gave both Mr. Horton and Mr. Parker a standing ovation when they walked to the stage for the press conference, and I talked with one pilot who said they were looking forward to “working with management to create a new American”. Here’s a look at the new television commercial that’s set to run starting tonight. The commercial is great. Love it. Is the Flight Global post the one you intended to link to? Don’t see much “great analysis of the merger,” just rehash that’s reported everywhere else.